Food is one of the things that Disney does best. A Disney vacation is largely about the food you get to eat, which is a lot. Between a grab and go breakfast at your resort, popcorn as soon as you enter the park, a quick serve stop for lunch, a Mickey Bar for an afternoon snack, and a three course sit down meal, you never go hungry at these Parks. When my vacation is over, I love to preserve as much of that magic as possible. One of the ways my family does this is by making some of our favorite WDW recipes for dinners. Here are my top ten WDW restaurant recipes you can make at home! This one is simple enough, but it’s a Trail’s End and Hoop-Dee-Doo staple and it’s delicious. This corn bread recipe is great because the result tastes like Disney and the prep is super easy. So if you need a quick side for a barbeque or are just having a craving, throw together these few ingredients and have a great time! This is one of those drinks that isn’t famous in the parks or really in general, but I love. Fresh mint tea is so refreshing and good for you! You can order this drink at Spice Road Table in Morocco in Epcot. In Morocco and many Middle Eastern countries, mint tea is as common to drink as water. It’s everywhere. And it can even be in your kitchen! This is the simplest recipe on this list, so make a ton! Recipe: Mint and hot water. Add some honey for sweetness and serve over ice! Done. Pasta is my weakness. If there is a pasta option on the menu you can bet I’m going to pick it. And if there’s a really good sauce on it, I’m done for. Several years ago I tried the vodka penne at Mama Melrose, with hesitation because I thought: “Vodka? Ew, I’m just a kid.” But no. The vodka made it. The sauce was so unbelievably creamy and rich in flavor that I was hooked. I’ve been back to Mama Melrose a couple times and this great dish was never quite as good, but I’m determined to make it perfectly one day. Crab cakes are kind of hit or miss. They can be perfectly blended or way too bready. But the Wave at the Contemporary Resort does them justice. These cakes are served as appetizers, but I could have them as my entire meal – they’re just that good. They are served with a lemon emulsion and fennel-arugula salad. Yum. I could eat food from ‘Ohana every day of the week. And luckily, I can! These wings are superb. I love chicken wings in general, but there’s something about the sweet and spice of these that make them something special. The flavor combination just works so well together. What’s cool about these wings is that they’re not that difficult to make. And don’t forget those dipping sauces! How I love pot stickers. There are just so many great things about them. From their layers of flavor to their pop-in-your-mouth ability, these are a terrific dinner option. 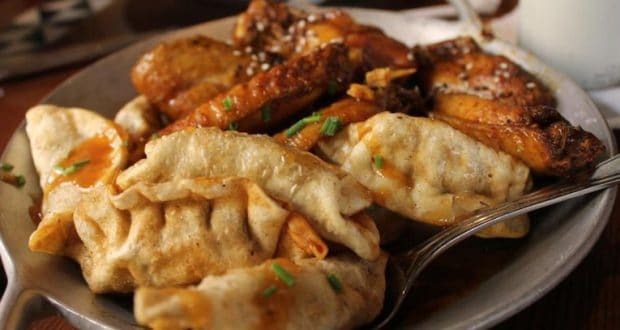 Pot stickers seem like they’d be easy to make, but they do take some technique. But if you have the time and patience, the results are amazing. I love stopping at the China kiosk during Food and Wine to grab these for a snack, but they’re also available at the Nine Dragons restaurant right inside the pavilion. Hummus is one my favorite things on the planet and has become a major part of my family life. We live for hummus. Especially Disney hummus. I’ll never turn down store bought or anything like that, but homemade is the way to go. And relatively easy to make! Pretty much every restaurant in the Morocco pavilion serves hummus so of course there had to be a recipe somewhere! Grab all the ingredients, throw them into a blender and you’re good to go. Cheesy soup is cheesy soup, right? Wrong. I first tried this soup at Epcot’s Food and Wine Festival, but you can find it year round at Le Cellier, Canada Pavilion’s amazing main restaurant. This cheddar cheese soup is thick and creamy and jam packed with flavor. The secret to its success is very good, sharp cheddar, Moosehead beer and Nueske’s applewood smoked bacon. Never underestimate the power of bacon. What even is Bobotie, you may be asking? Excellent question. Let me illuminate your brain and taste buds. Bobotie is a South African traditional meat pie dish. It is known for its unique spices, such as turmeric, cumin, and coriander. These flavors just explode in your mouth. As delicious as this is just as a meat pie, it’s even better with a mango chutney topping. A savory and sweet combo is a beautiful thing. This delicious dish can be devoured in epic proportions at Boma on its glorious buffet. Just try it. And then at home be warned that this recipe has lots of ingredients and lots of steps, but so worth it! This is the one. This is the pièce de résistance. You have never had meat and mac and cheese like this before. This dish gives you an explosion of flavors. You’d think that mac and cheese would make a dish less fancy, but you’d be wrong. It’s the perfect compliment to soak up that scrumptious sauce. The chicken just melts in your mouth as it soaks in wine all day. And the mac and cheese has so many different kinds of cheese in it, you can hardly tell what your favorite taste is because they all go together so beautifully. I love these recipes. I hope you try some of these out, think of Disney and enjoy! Just think Remy: Anyone can cook!